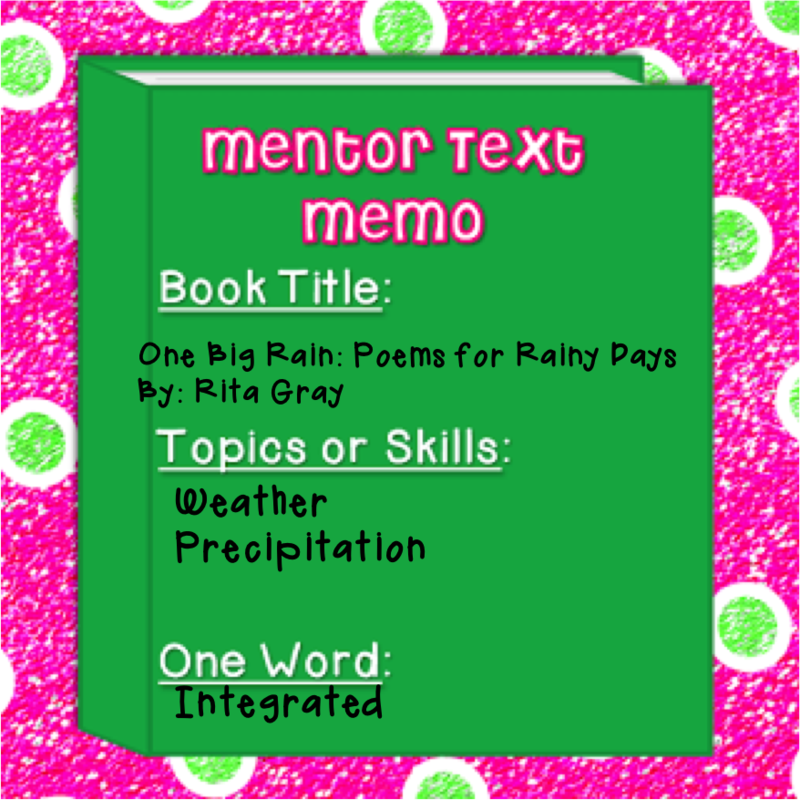 Mentor Text: One Big Rain and a chance to win! The first step to recovery is admitting it, right? Big books, small books, square books, round books. Long books, short books, chapter books, picture books. I don't discriminate, I love em' all! How ADORABLE and beautiful is this cover?! I try and integrate all subjects as much as possible, and I love using poetry to get my kiddos more exposure to different types of writing! This book has 20 different poems written by famous poets (like Carl Sandburg). They are all about precipitation. They're divided up by season, too so it's great to teach about the changing of the seasons and what precipitation is like. 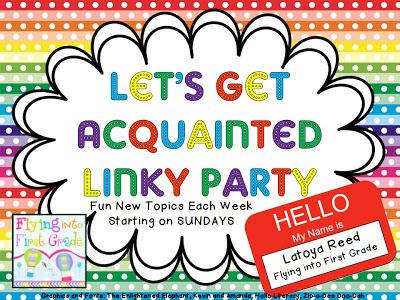 I'm also linking up with Latoya at Flying into First Grade since I've missed this amazing linky the last two weeks! This week's topic: 3 favorite places in our second homes, our classrooms! If you read above, you know I love books. So obviously one of my favorite places is where i house all of these books- our library! We keep fiction books in the blue bins, and nonfiction in the green. I love that the kiddos practice genres when putting the books back, and can see the covers clearly in these bins. I also love that they learn the genres they're interested in so they can look for books fast! Happy Sunday everyone! Have a great week! 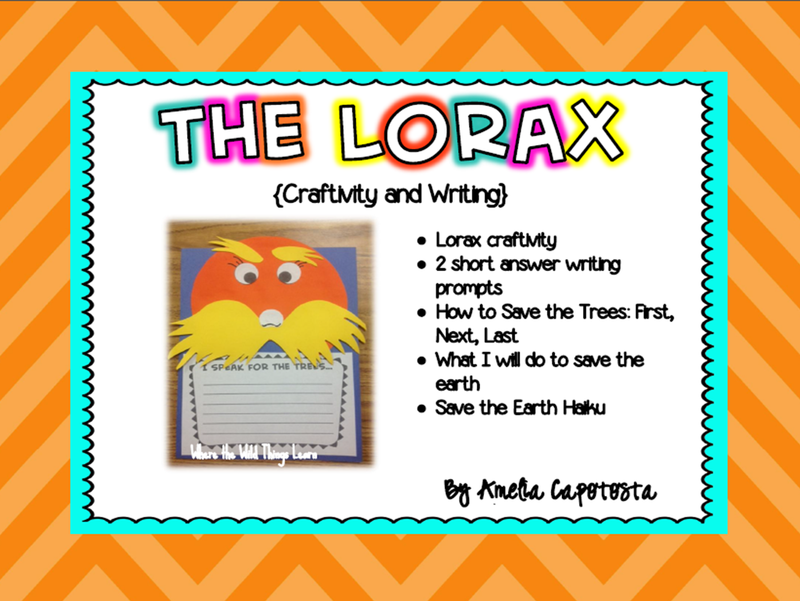 We are celebrating Earth Day tomorrow in our classroom with a little Lorax Craftivity! We read the book on Friday and started working on our writings! Tomorrow we will take time out of test prep review and make our craft and watch the movie! I love the idea do integrating science and LA. Great idea! 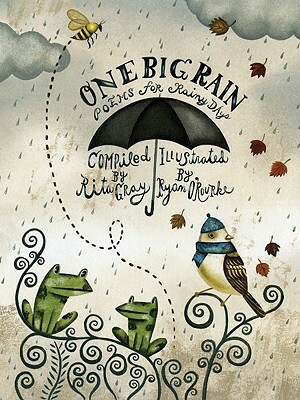 I agree with you- the cover of the Rainy Day poem book is beautiful. Since you enjoyed that book, have you tried "Poems for Two Voices"? It's a book of two part poems- read by two people at the same time. My students love to perform these poems! I am also loving your classroom! I love your classroom colors! I love integrating reading into my content areas and this book looks like one that will be making its way to my Amazon cart soon! :) For Earth Day, we are performing "The Great Kapok Tree" for our buddy class. They kids are psyched! Glad I found your blog! That book looks fantastic-putting it on my wish list now! I love your favorite places!! I am loving the colors in your room!! The reading corner is great! We do a "We Love the Earth" craft and writing activity! Ooooo, I love that you don't even science and yet you still integrate it for your partner teacher AND you still linked up! Wohoooo! You rock!!!! Where did you get those circle rugs??? I have to have them!! They are the perfect colors for my room and I have polka dots in my room too! Love it!! I'm so excited you linked up! Yay!!!!! 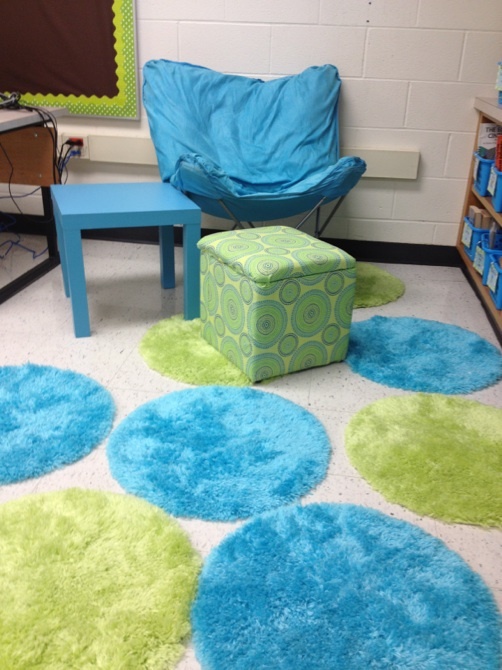 Your classroom is so cute- and color-coordinated! I love the "I Can" board - helps to motivate students and hold them accountable too. Found you through the linky - and am so glad that I did! I love your reading corner. Such a great idea with the little round mats! I also love your color scheme! Adorable! That is a new book to me as well! We made earth bracelets on Friday. This little craft would be perfect to do tomorrow! Your room is absolutely adorable!! Love it! And, I am a fellow book addict as well! I want to check out this book to look at just for the poetry unit we will do in May. It looks really cute. 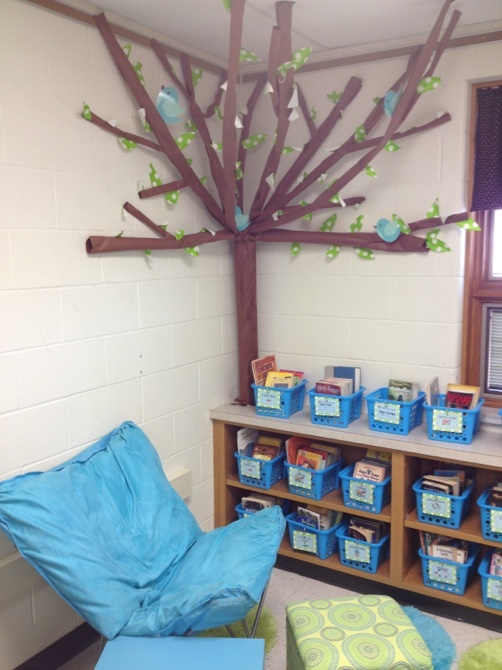 I am loving your reading corner! It's amazing! :). 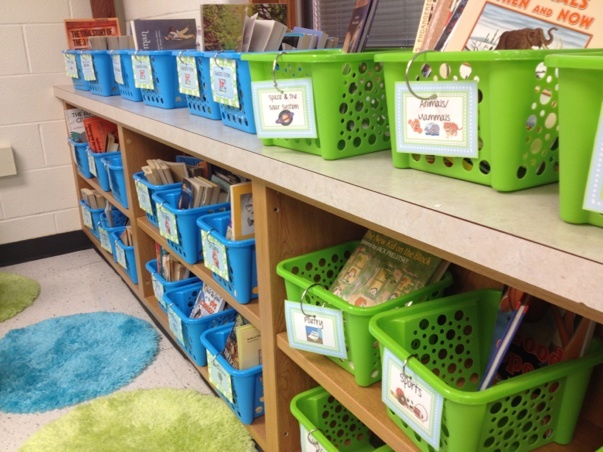 I also love those book baskets - where did you get them? 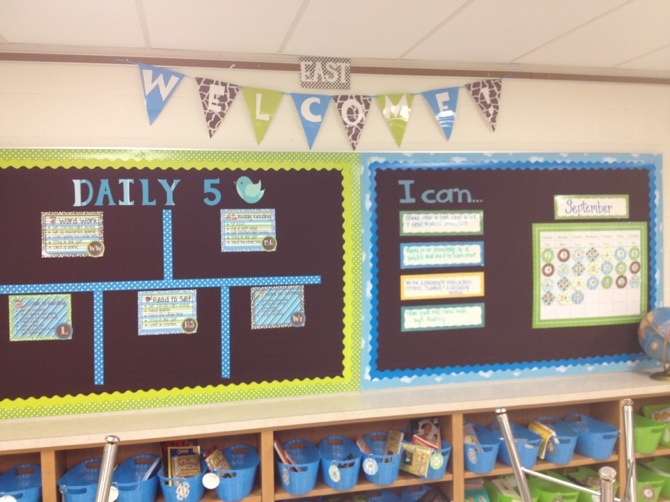 You hae an amazing blog and a fabulously coordinated classroom. I'm so glad I found your blog. Thanks for letting us peek into your classroom. He performed in a similar Olympics where Jesse Owens put trip to the bits of gossip that Germans were the "absolute best race" of individuals on earth as African-American Owens beat the vaunted German Olympic group multiple times on olympic style events.